I already had visions of fruit trees in flower, apples, orchards, and cider in my mind when I got the What’s Brewing editor’s email suggesting Renewal and Revitalization as a theme for this issue. I had seen fruit blossoms on Saltspring out in colour and this was only two thirds of the way through January. A great new growing season is coming! It struck me that I haven’t talked much about cider in the last few years, but this ancient beverage is enjoying renewed popularity in these modern times. Cider and cider events are happening everywhere. In my vagabonding life, I have visited cider taverns, pubs, houses, cafés, orchards, and country farms. I’ve enjoyed cider with local folks in taverns, inns, and restaurants, in villages in France, Luxembourg, Germany, Austria, Belgium, the Netherlands, Hungary, Canada, the U.S., and of course the U.K. I’ve been lucky enough to drink pints of cider in UK country pubs where they don’t normally serve outsiders pints, and with the farmers who grew and made the product. I’ve had Dorset rough scrumpy for starters. 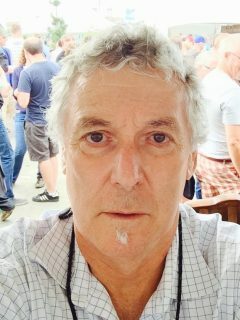 I have done a number of cider stories for What’s Brewing over the last 27 or more years, and I remember the local pubs, ciderworks, and villages well. Old traditions hang on for centuries and we see cider now in the social media world, fully out front, and revived in a new way. In some places, the fermentation of choice has been cider since time immemorial. In the U.K., the counties of Devon, Dorset, and Somerset are known for their cider, but cider culture is strong all over the U.K. I have tavern yarns from Yorkshire, the Cotswolds, Scotland, and Wales, too. I learned a lot about cider in the Brittany region of France, where it was paired with sweet and savoury crepes. Cider can be found all over France and has always been part of the people’s culture. The same is true of a small region outside Budapest, where village lore ties into the orchards and cider taverns. Cider was readily available throughout Hungary even two years after the fall of communism; local craft cider was coming back. Even with beer culture being so prevalent, every little hamlet, village, town and city in Germany and Austria has had cider for centuries and locals would not change a thing. It’s just always been there but has now emerged into the world of media, local events, and creative image marketing. Cider culture came to the USA with the first colonial settlers; in the first taverns, cider was the strong grog of choice. Apples followed the trail of settlement in the early USA and remained strong into the eighteen hundreds, when beer stole the spotlight. In Canada, British heritage made cider a part of the landscape across a young country. Nova Scotia, British Columbia, the Niagara region have always been apple, pear and fruit tree centers. Again, when I started writing in What’s Brewing, most of the cider in Canada was imported from U.K. Now, as in the rest of the world, cider has taken its place in the craft beverage movement. The varieties are seemingly endless; a large variety of other fruits creates a diverse range of ciders to suit all tastes. 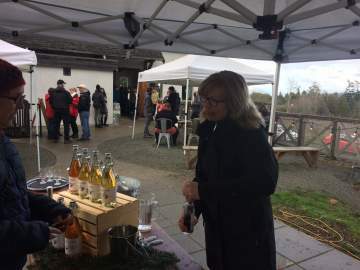 Canada has almost 150 cider producers: 54 in Quebec, 48 in Ontario, 33 in BC, 8 in Nova Scotia, 3 in New Brunswick, 2 in Alberta, and 1 in Saskatchewan ; and I am sure things can change daily on a planet gone wild for craft everything. 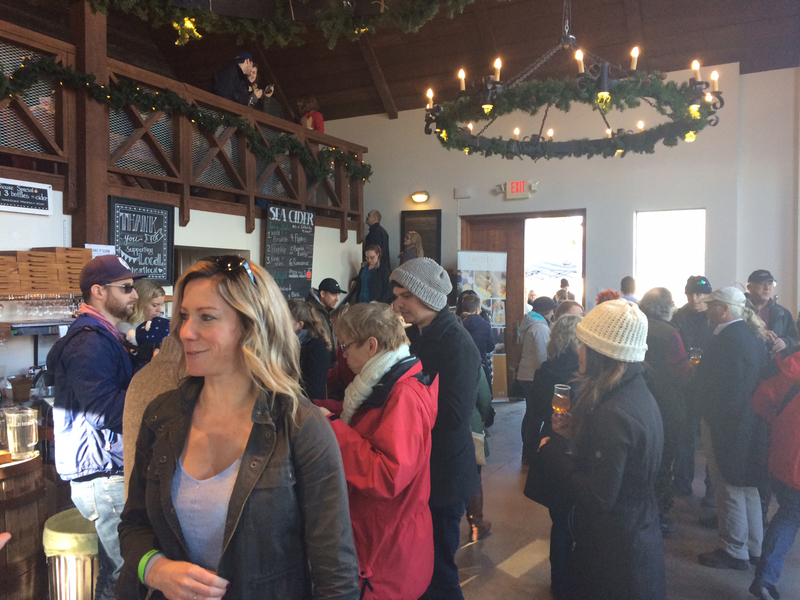 I enjoyed this mellow event at Sea Cider. Absolutely historical, going back centuries, and right in character. Kristen (owner) did tours for the visitors of the grounds, cider house, kettles and tanks, orchard and talks. She had lots of attention from the crowd. Inside the cider house was center stage for local crafted, interesting food; a Thai curry box 4 bucks, and various other craft hors d’oeuvres, sliders, pulled pork cup, and the like, 2 bucks. 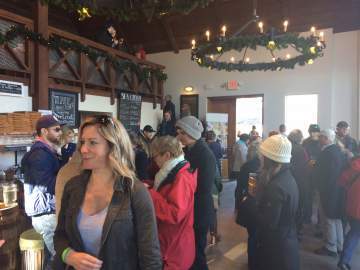 Patrons enjoyed ciders, and artisan food, in an relaxed family atmosphere. Cider tasting glasses cost two bucks. They do a range of exciting ciders. They had a one day sale: 2 bottles of sparkling cider $30.00. Thanks to the team: Kristen, Mike (Sales Manager) and Sara who makes it happen in the marketplace. What’s Brewing and Sea Cider have been acquainted since their first day. Weather for the event was fantastic when the sun came out, as if on cue, from noon till 2.30 then it slipped behind the clouds. A local musician did tunes which allowed the guests to converse easily in the cider house while folks happily enjoyed their food and cider. People talked and talked. The ambience was perfect for it. People just had community going on. What’s Brewing made new readers and friends. 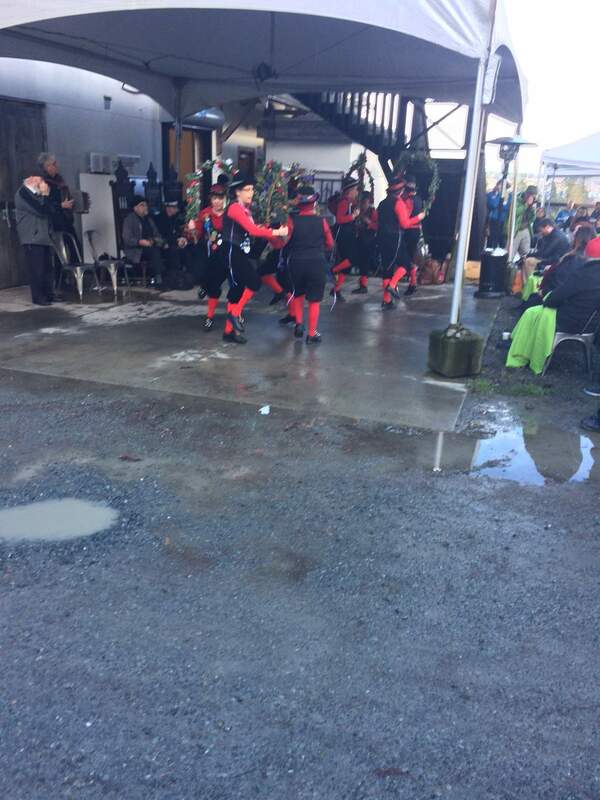 We had Morris Dancers, set up around the hand-crafted British chairs that were in the original Brother John’s in Gastown of long ago, chairs that have seen many a celebration of drink and dance. They did a true historic Morris Dancer act. The English heritage dates to 1448 in the U.K. and it has big story, complex and involved. At 2:30 they blessed the orchard, and the cider world continues like it has for centuries. On that note, let’s raise a cheer to the trees, and to the season.